YEA CAMP IS HIRING FOR THE SUMMER! Take our quiz to see if you should apply to work at our life-changing summer camp for social change! 1. Want to work with the best teenagers in the world and have a super inspiring experience with amazing staff in a beautiful location this summer? Do you want to be an important part of a program training and supporting the next generation of changemakers addressing the pressing issues of our time? 3.Do you have experience working with teenagers (either at camps, as a teacher, or other youth programs) and want to mentor and support inspired young people who want to make a big difference in the world? 4. Are you comfortable as a teacher, facilitator, or public speaker to be in front of the room, direct a group of people in a loud enough voice, and lead activities in an engaging way? 5. Are you self aware, having overcome challenges and done work on yourself, and willing to go out of your comfort zone to be a role model for campers to overcome their own obstacles and move beyond their fears? 6. Are you willing to be silly enough to lead goofy name games, play “Big Booty” (don’t worry, we’ll teach you), and get down at the dance party, and are you also open-hearted enough to really share yourself in our community in a way that makes it safe for campers to be themselves and feel accepted? 7. Do you have great judgment to ensure safety such that parents would be thrilled to have you look after their kids? 8. Are you a good communicator, don’t create or encourage drama, and committed to being a team player – even if something isn’t going your way or someone is not behaving as you’d like – to help ensure a great experience for everyone at YEA Camp? 10. Are you available this summer to work at one or more of our 8-day, 7-night camps, as well as attend a 4-day staff training immediately before, in Massachusetts, New York, or California on these dates? IF YOU ANSWERED YES TO ALL OF THESE QUESTIONS, YOU ARE OFFICIALLY HIRED! COME WORK AT YEA CAMP IMMEDIATELY! We are hiring counselors, chefs (head and assistant), and a health supervisor for each of our sessions and a photographer and videographer for at least one session. We are also hiring for someone to work on publicity and administrative work in the months before YEA Camp begins. Take a look at our detailed job descriptions here and apply this instant! Or at your earliest convenience! We can’t wait to hear from and hopefully work with you this summer. To apply, submit resume, references, and cover letter explaining your interest in working for YEA Camp, and which session(s) you’re interested in working at to info@yeacamp.org. 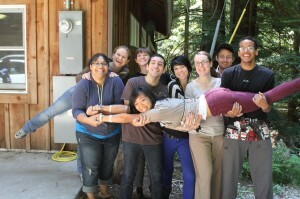 For more information about YEA Camp, visit www.yeacamp.org. And please also spread the word by sharing this blog post with others who might be a great fit as a staff member, or sharing this post with potential campers aged 12-17 who would love YEA Camp. Thanks so much for your interest in YEA Camp! We hope to hear from you soon and to work with you this summer! This entry was posted in Youth Empowered Action and tagged animal rights, bullying, camp chef, camp nurse, climate change, feminism, gay rights, racism, social justice, summer camp, summer job, teen camp, vegan, youth leadership, youth leadership camp. Bookmark the permalink. 1 Response to TAKE OUR QUIZ: Should you work at a life-changing leadership camp for teens changing the world? Are you an activist-educator and would like an amazing job this summer? OR do you know a teenager who wants to strengthen their activism skills to make the world a better place? I worked with Youth Empowered Action camp as a mentor to teen activists last summer and can’t recommend it highly enough.